“The PLP joins our voice with the Bermuda Union of Teachers in expressing grave concern over the current state of our schools,” Shadow Minister of Education & Training Lovitta Foggo said today. 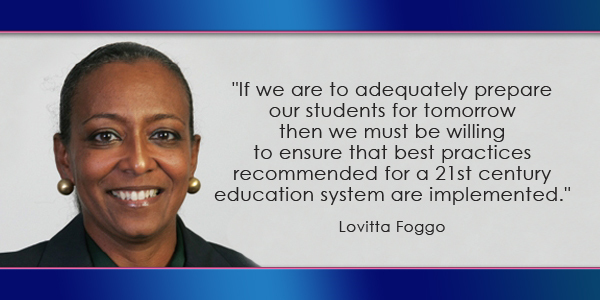 Ms Foggo said, “If we are to adequately prepare our students for tomorrow then we must be willing to ensure that best practices recommended for a 21st century education system are implemented. “The SCORE committee did a comprehensive and detailed review of our schools, and I question whether the OBA government, who can ill afford to cherry pick or use a bandaid approach in response to SCORE’s findings, is seriously committed to the advancement of our educational system. “There are many who have argued that class size and the physical conditions of schools, among other issues, seem to have had little impact on a students’ outcome. Research has proven, however, that the environment currently needed to enhance student success does impact student productivity. “Times have changed and technology is a major influence in that change! Technology and the exposure available to students, have greatly impacted instructional methods, the learning environment and consequently teaching techniques have had to be modified to meet the learning styles and needs of our modern day students, to ensure that our students are adequately prepared with the skills to successfully operate in our society today. “Employing 30 year old strategies in today’s environment ‘will not cut the mustard’. It will not prepare our children to be key players in the 21st century, It will not prepare our youth to compete globally, and it will not properly equip our students to take up employment in their own country. “It is evident through research that when a government adequately invests in its education system, it gets better desired student outcomes. We must have the appropriate infrastructure and resources so that our children can excel in class. “It is inexcusable that the governments of the past, and the current OBA government have not provided the environs necessary for a quality education in our institutions of learning. “On behalf of the PLP, I thank the Minister of Education for tasking SCORE with the review and now ask that he seriously commit proper resources to render our schools to a state needed for optimal learning. “A quick fix won’t do, and a proper fix must do! Closing schools is not an acceptable solution when it will not fix the issues we face, nor will it meet with best practices outlined in SCORE. “The PLP believes that providing our students with a quality education which nurtures and develops our young people into expert, competent and confident individuals who are equipped to assume any role in our society or beyond is the order of the day. “Our Replies to the Throne Speeches 2013, 2014 and 2015 all placed Education as a main priority, as we understand our people are our most precious commodity, and our youth are a gem that we must invest in. That all sounds very reasonable MP Foggo BUT, have you forgotten which political party put us in the fiscal mess we are in?? For your convenience I will remind you? It was YOUR plp, and may I also remind you that, you and YOUR plp did next to nothing for education during your entire 14 yr reign of terror!!! How someone such as mp Foggo, can say this stuff with out first admitting their own failings is totally beyond comprehension to those of us that do our best to be honest at all times!!! This statement from plp/Foggo, is nothing more than just the same old nonsense from them, that happens to be released a few days before a by election?? When the plp finally become honest and admit who’s fault this fiscal mess Bermuda is in, then and only then will I take anything they say seriously!!! Have you forgotten which government created the educational system in place? And may I ask you what does that have to do with what mp Foggo is rambling on about in this statement of nonsense?? Also, may I remind you of two other facts?? First fact is, this system was put into place by the UBP after the plp suggested it and second fact is, the plp had 14 looonng years to change it and they didn’t?? Hope that helps you??? Do you remember that Kangoo car…because as much as you like to like to point fingers at the PLP, fingers can be pointed at your dear administrations from yesteryear for creating the economic and racial divide in the first place, the divide the PLP wrongly tried to spend its way out of…admittedly. That was like more than thirty years ago. Yup the bad ol’ UBP, changes championed by the same Berkleyites that are still at the DOE today. Have you also forgotten whose government had the chance to revert back to the old school system but instead helped build The Berkeley Institute into a Second Senior school. Also at that time didn’t the PLP help out the BIU over a substantial amount of money during the construction of the new Berkeley? $6.8million performance bond to be exact. One of the PLP’s Election Platform Promises in 1998 was to fix Education. Dame Jennifer Smith, who was on the Board that changed the system under the UBP was elected Premier. In 14 years the PLP switched Education Ministers like we the people switch underpants. Now the PLP want the OBA to fix Education. No wonder nothing gets done, too much political posturing. Plus interest. The gift from the people of Bermuda to the Union was far larger in the end. You are toooo far from the truth Kangoocar/.westpalm!!! MP FOGGO, you are doing a fantastic job. Thank goodness for SOMEONE like you to speak out about incongruencies and wanting a better educational system for OUR youth. Continue to speak out FORCEFULLY AND WITH ZEST about the mess that is currently happening. Hats off to you, MP FOGGO!!!!! Here we are right before registration for the next school year and parents don’t know what this report might entail. This report could have very useful information that parents could use to make very important decisions. I hope Mr. Scott releases it soon, along with what the Government plans to do to fix the problems. Not very well said… unless it was just a political speech. It is all fine and well to harp on about the trouble in our education system, but to stand there and say that the government should fix all these problem at once, when the PLP left in a financial state whe we will be lucky if we can address maybe half of the issues in the next several years. To say that school closures shouldn’t be an option when there are underutilizes schools that are raising the cost per child to educate just to keep them open… when consolidating schools will allow more of the education cost per child to actually be spent educating our children and not just keeping a building together. How can she stand there and say ‘The PLP believes that providing our students with a quality education which nurtures and develops our young people into expert, competent and confident individuals who are equipped to assume any role in our society or beyond is the order of the day’ when the PLP neglected the education system even when we had money that could have prevented many of these issues. When are we going to hear from anyone in the opposition ‘The PLP are incredibly sorry for the damage we did through gross elegance and mismanagement of government affairs, that has led to this stifling financial conditions whose damages will effect generations to come’. Surely they aren’t that self-absorbed and -righteous to not see the huge part they played in where we are today. Honesty, integrity, humility… let’s see a little of that from the opposition before they try to critize the government again for not doing something, they (the PLP) made impossible to do. You and your useless PLP had 14 years to turn around education for us… YOU FAILED. And education standards were stellar under the UBP? Hardly stellar. But if the PLP knows how to fix things why didn’t they do something about it when they were in power? Let’s do what the PLP did….throw tonnes of money at a project from which lots of stuff can go missing and benefit certain people. Then we can claim that we were really working on education and not just shifting ministers around that portfolio every few months. Then when a new government comes in we can complain that public education is a mess in Bermuda. 14 years! You guys had 14 years to do the right thing in education and yet you did nothing for the kids in reality. Outrageously expensive bricks and mortar do not educate children. And oba has had since 2012 and has done what??? About the same amount that the PLP did in the previous 14 years. That is if you don’t count throwing tons of money at projects that didn’t begin to address problems with the education system itself. What happened to the PLP’s ‘adopt-a-school’ scheme introduced in 2010 as a means to get private companies/individuals to pay for school up-keep? And more money has been plowed into education over the years with the examination results remaining the same (poor). A ‘C’ is a minimum grade deemed to be acceptable for recognized and reputable universities. In 2015 the average amount of exams sat by a student ranged from between 1 or 2 (private schools range usually between 7 and 11). The worst school in the UK (based in Croydon) recorded a 31% A*-C grade with the average number of exams sat by a student being 5. This is also a school where 40%+ of their students are immigrants whose first language isn’t English. And that doesn’t take into account that female public education students nearly double their male counterparts in terms of graduation rates. Who is letting these young males to drop out of school? Sorry, Ms. Foggo, but more monies (as evidenced by past results) simply doesn’t equate to better results. No one person can be blamed for the situation. An overall improvement in teaching standards (as acknowledged by the PLP in their suggestion to bring retired teachers back into the classroom to assist with current teachers) coupled with more involved parenting is the only true solution to our education mess. All the accusations at the PLP can be tossed by commenters, but the truth of the matter is that the OBA is the current government and have current responsibility for the education system. They find the airport project critical but yet education is allowed to flounder. They find money for Americas cup, but decrease funding annually to education. The airport and the America’s Cup will boost our economy. And I have a bridge to sell you. Sounds just like the PLP leader ! If you actually look at the GCSE examination results they have improved over the last few years, albeit only marginally. But they remain poor. More money doesn’t immediately equate to better results. Better teachers and parenting are required. All budgets have been reduced, not just education. In one of the PLP’s last budgets they decreased education by circa $10mn while simultaneously increasing the tourism budget despite poor results. Where were you then? Not true – they do want your SAT scores but they do want to see your marks. The kids are NOT the problem…. Unqualified or under qualified teachers are, protected by a union….. The Department of Education should be _____, and all the folks there sent out to pasture…..
Every politician in every party has figuratively died during their tenure as Education Minister. PLP found the money to build a big white empty elephant called Grand Atlantic but education was allowed to flounder. Onion juice. What do you have to say about that? That’s right nothing cause you and I both know the truth. Can the PLP explain, in detail, why they think replacing the, recently implemented, Cambridge Curriculum (GCSEs) with a Caribbean one will somehow improve our public education system? I mean it wasn’t too long ago that the PLP reintroduced the Cambridge curriculum and now all of a sudden they want to turn education on its head and replace with yet another curriculum? That massive change is on top of the reverting back to multiple senior schools. All those changes will simply result in a lost generation until the changes have been given time to take effect (i.e. retraining teachers, repurposing schools, redesigning the MoE. What is the PLP’s rationale for such a curriculum change? It will improve the results because the standards will be lowered! Quite simple PLP logic. If I produce something of lesser quality but in higher numbers by lowering the overall standard then I can politicise it a lot easier! Kind of like the Island’s tourism policy during the PLP years, get higher numbers of T-shirt buying tourists so arrivals look good, but forget about the ones that spend thousands in hotels. It won’t though will it….If teachers can’t teach a curriculum well enough to engage the minds of our kids, then doesn’t matter what curriculum you use, the results will be below par. Improve the teachers , improve the results….stop wasting time on the periphery and cut to the quick. Teachers who are not up to standards…..goodbye. Parents need to push for this NOW and stop flapping politely on the perimeter. Listen, I think the PLP are politicking as usual here, but we have to stop with this whole Caribbean=inferior attitude to everything. CXC/CAPE achievements are just as solid as GCSEs. If there are cost savings associated, then it may be worth a look. I agree with hmmm, it’s not the curriculum at all at fault here. We have to get everything else back up to par and get our students achieving. 3. It is the opposition’s job to challenge the government on education (something that the UPB did not do well when in opposition. As I see it if the OBA are serious about education reform the way forward now would be to form an education Authority much like the Tourism Authority. There is plenty of blame to go around for both parties but this would at least get the politics out of education. Everyone needs our education efforts to succeed. I may not agree with your statement, but I do agree with an Employment Authority designed to bring back Tec. and bring efficiency and standard up to that of Private schools. I suggest no unions allowed….these are our children, it is not your playground teachers. Don’t know if you were around when The Tech was respected & producing results, headmaster Rumbello I believe it was at the time, but the great whine at the time from the PLP was that The Tech was all part of a grand nefarious scheme by the UBP to keep black Bermudians in blue collar service jobs. Now look who wants The Tech back. There are some who can never be pleased. “Common Core”…research this then you might understand why the system is failing. The number of times I pleaded with the OBA to radically change education fell on deaf ears. Education has been the worst of the government ministries since 1968. Our kids are being taught on a system created for another time. The bloated Department of Education coupled with the BUT have left our kids stranded in another century. Education in Bermuda public schools is poor. Facilities are dire. It is a disgrace that we continue to take care of aging employees in the DOE whilst our kids struggle. Teacher standards and qualifications are poor. There should be zero teachers in our schools preparing our kids without a minimum of a masters degree…. Ms Foggo, only one question. The PLP were in office for 14 years – why didn’t you do something about this when you were in power? She was my teacher, and she was one of the best. She has tried to improve education for over over 10 years. Stop making false accusations. yess, what are you talking about? While she may have been a good teacher that has nothing to do with the actions of the PLP while they were in power. They had 14 years to fix things. And now all of a sudden it’s the OBA’s fault for not doing in two years what the PLP didn’t do in 14? So I repeat – the the PLP knows how to fix things why didn’t they do anything while they were in power? Did she teach you how the OBA were going to put you in chains and put you back on the plantation? Or was that just her being a politician….just like in this article. She is highlighting perceived OBA failures while totally ignoring her own party’s failures. Bermuda allows International Business giants like GOOGLE to pass 12 BILLION a year through local law firms and banks…… without even leaving a CRUMB for the island…..
Just multiply that TAX benefit by hundreds of other companies…… and we are missing a huge opportunity. Just a mere small contribution could raise enough $$$$ to rebuild the schools of Bermuda and bring in educators trained to teach children for the needs of the 21st century. EDUCATION needs a new beginning, and Bermuda should be talking to these companies to leave something real on the table, instead of just making lawyers and accounting firms rich…..
At thousands more per student per year than the most expensive private school, the taxpayer is being fleeced by the seat warmers at the DOE & inefective teachers of the BUT. Pravda, you might want to ask why those companies are here. The answer is simple – no tax. The problem is a little thing called the Exempt Companies Act which promises that there will be no tax levied on the profits of exempt companies until 2035. That was extended from 2016 BY THE PLP. Let’s be absolutely clear here . You must make it crystal clear that you’re referring to ‘no corporate profits tax’. They’re already paying plenty in all of the other taxes including the ‘call it by any other name’ income tax . The last thing we need is to continue to perpetuate the fallacy that we’re a tax free jurisdiction . True. And let us not forget what happened when Paula announced an increase in payroll taxes. We started hemorrhaging jobs and we’re still paying for that. BTW, you are correct that we’re not a tax free jurisdiction – the total tax burden is roughly 20% of GDP – to put that in perspective the US comes in at 28% and Canada at 33%. The PLP had 14 years to do something about the public system. One of the best ways to address the disparity in opportunities for Bermudians and especially Black Bermudians when it comes to wages, is to ensure that the level of education and discipline is on par with that of the private system. And considering that it costs more per child in the public than it does the private, there is no reason for a disparity to exist. The education system is a microcosm of Bermuda in general, divided on socio/racial/economic lines and all I see and hear from politicians on BOTH sides is lip service. You know, whenever there is anything negative to be said you can bet your last dollar that Kangoocar, real, aceboy and hmmmm are at the helm. Do you remember it was YOUR government that kept Blacks out of schools, jobs, VOTING, banks, healthcare, basic human rights and yes education? Do you remember when all of the lucrative scholarships went to your already privileged children of your back room cronies? Do you remember it was YOUR party who arrested Blacks for walking in their own country…calling it wandering abroad? Do you remember how YOUR party represented ONLY the interests of the white minority, and segregated us in everything? Do you remember it was YOUR party who closed the Technical Institute who had the distinction of graduating Black students who became “too qualified” in your UPB world? Actually I do not remember very much of that at all. I am only 50 years old. I read about it though. Except for the Technical Institute thing, I remember that….I also remember seeing the PLP applaud it because they felt it was in place to keep blacks in blue collar jobs. Any idea when the full SCORE report will be released?